You know that moment when you are sitting at a restaurant and you hear the sizzling of a hot skillet as that smell of freshly cooked fajitas hits you smack-dab in the face and everyone at your table takes a collective sigh as they covet the smiling person with a plate full of fajitas in front of them? Okay, you may not have that experience every time you choose enchiladas instead of fajitas, but I do. In honor of National Fajita Day and in preparation for Fajita Fiesta, we set out to experience every fajita in town and chose our Top 3 Fajitas in Buda, TX! Follow our trail and let us know your favorites. A popular breakfast taco spot, Helen’s knows tacos--it’s what they do. So we weren’t surprised when their beef fajitas were only available as a taco. We grabbed a beef fajita taco plate and devoured it. Though they were a little more on the dry side than what we normally prefer, the flavor mixed with the best sauteed green peppers and onions were so good we had to add it to the list. Not to mention, if we were offered a second helping of rice, we would not deny it. If you are looking to take your fajitas on the go, make this your go to spot. If the full parking lot wasn’t indication enough, this place is a lunch favorite among the locals. Cooked with more seasoning than the rest, if you love your fajitas packed full of flavor this is the spot for you. We piled our tortillas high with super juicy, flavorful beef fajitas topped with guacamole, sauteed green peppers and onions, and that classic Garcia’s salsa. We aren’t saying this place is our favorite spot for fajitas, but we are not saying it isn’t either…Let’s just say with a whole section on the menu dedicated solely to delicious skirt steak, they know how to do fajitas right. We stuck with their classic Slick’s Beef Fajitas, but for those looking for something new they also sell shrimp and pork fajitas. We smiled as they placed a sizzling skillet in front of us and dug in. For the perfect fajita taco, we stacked it with black beans, cheese, sour cream and of course their salsa for just the right amount of heat. There is something to be said about the combination of ingredients that make these tender, juicy fajitas unforgettable. We here in Buda are fajita fanatics. So much so that we have a weekend dedicated to fajitas! The 4th Annual Fajita Fiesta takes place on September 29th & 30th. This FREE festival will showcase a blend of foods, music and cultures as attendees experience headliners Rick Trevino, Selena impersonator Amanda Solis, the Chihuahua Beauty Pageant, and Fajita Cook-off. For a full list of details visit their website. See you there! There is a new event coming to Buda, Texas, or more accurately, coming back. 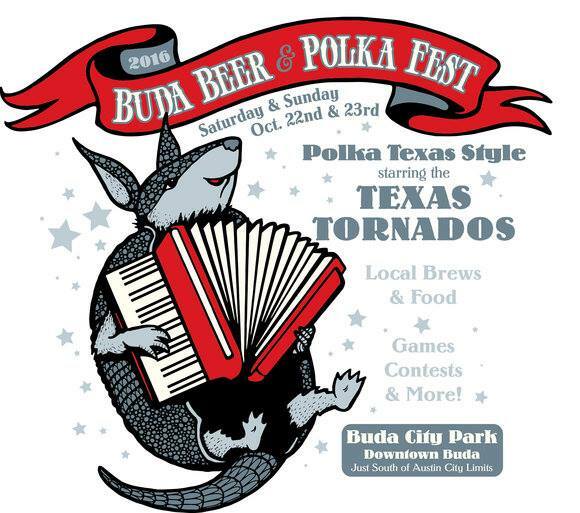 The Buda Beer and Polka Fest will take place at Buda City Park on Saturday, October 22 and Sunday, October 23, 2016. The last time Buda saw this festival was in 2011 and we are excited to see it return. This event takes place between two popular German beer festivals in the central Texas region, so we are proposing a German Beerfest Fanatics Trail with these three stops this fall festival season. What goes great with accordion music? Beer! There will be a large variety of local craft beers, as well as, Texas favorites on sale to wash down all the food from the international food court. The food court will cook-up many of our festival favorites that range from German to Mexican and Cajun to Texas-style. The website also says that there will be rides for kids, games, contests and a washer tournament. There are still more details to come, like a full music line-up and more activity details, so go check out the Roadway Productions webpage for this event.